Yeshiva University’s Graduate Program in Advanced Talmudic Studies (GPATS) held its 13th annual commencement ceremony on May 21 in the Lea and Leon Eisenberg Beit Midrash. 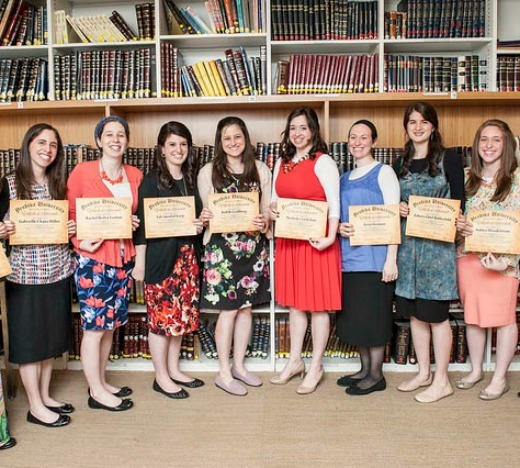 This year, ten women proudly received their degrees after extensive study of Talmudic texts. 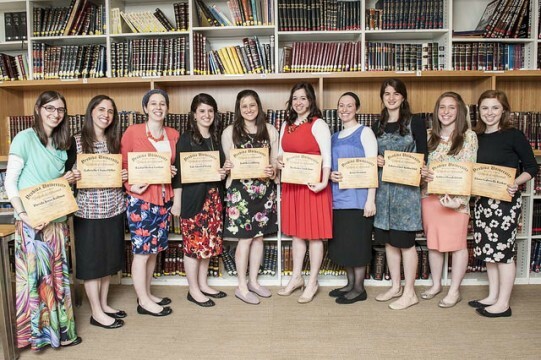 GPATS is a two-year master’s program that provides women an opportunity for post-college, high-level study to further their growth in Torah knowledge and skills. Launched 14 years ago by then-YU president Rabbi Dr. Norman Lamm, E. Billi Ivry University Professor of Jewish History, Literature and Law Rabbi Ephraim Kanarfogel and Dr. Monique C. Katz Dean of the Faculties of Arts and Sciences Dr. Karen Bacon, the program strives to create an elite cadre of female scholars of Talmud and halacha who will serve as leaders and role models for the Orthodox Jewish community. The program’s new director, Nechama Price, instructor in Jewish studies and Bible at Stern College for Women, opened the ceremony with words of praise for the graduates and discussed this year’s focus on women’s leadership, as well as the benefits and challenges these young scholars are likely to encounter. In 2000, a generous grant from the AVI CHAI Foundation enabled Stern College to launch GPATS, envisioning a cohort of excellent students each year who, already possessing a significant background in Talmudic studies, were seeking to further enhance and refine their understanding of Judaic studies as well as earn an advanced degree. Since then, the program has evolved to provide students with pedagogic training and opportunities to engage synagogues around the country as scholars in residence and learn about placement opportunities in significant positions within Jewish education. For the first time, the program’s new director, Nechama Price, is also one of its alumni. Price is a YU graduate three times over, having earned her undergraduate degree at Stern, her master’s in Jewish education from the Azrieli Graduate School of Jewish Education and Administration and a master’s in Bible from the Bernard Revel Graduate School of Jewish Studies. Her experience in the program, as well as the world of academic Judaic studies and Jewish education in general, is invaluable to the students: “We go through different challenges in terms of Jewish education, and I can help guide them through these challenges, having been in their shoes,” she said. GPATS graduate Gabrielle Hiller felt that it was critical that opportunities for women to spend time immersed in Torah learning are made available–not only so women can understand and connect to their mesorah [tradition], but also to enable them to be thinking, educated, and contributing members of the Jewish community.